Shuckin' Shack of Jacksonville, NC is Now Open! 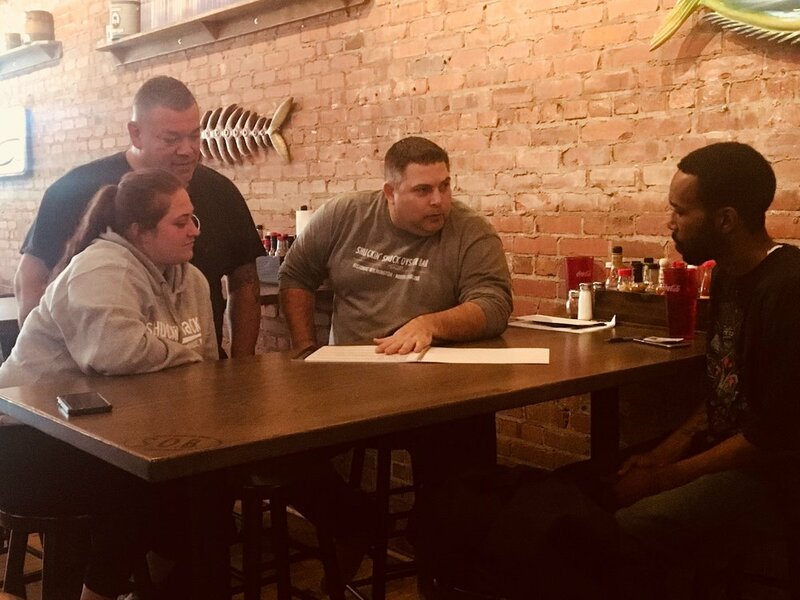 We’ve documented the various setbacks our franchisee, Ray Rubin, has had since signing his Shuckin’ Shack franchise agreement back in January of 2018. Even though damage from Hurricane Florence might have slowed him down, Ray is clearly not the type that gives up easily. Thanks to Ray’s tenacity, today, we are happy to report that our 16th Shuckin’ Shack Oyster Bar & Sports Pub is Now Open for business at 2421 Gum Branch Rd in Jacksonville, NC 28540! Raymond Rubin (standing) interviews potential staff prior to opening in Jacksonville, NC. I was considering a Firehouse Subs franchise or a Chick-fil-A restaurant. Basically, the reason I chose Shuckin' Shack was because of the atmosphere - the friendly feel - like when I walk in there. And I truly enjoyed myself - from the minute I walked through the door until the minute I left. Everyone that works there was very welcoming. They all worked as a team to make sure you are satisfied. We thank Raymond for choosing “The Shack” over the more nationally known names and we believe that the friendly, welcoming atmosphere that he loved so much will be certainly be repeated in our new Jacksonville location. For those near Jacksonville, we encourage you to visit our newest restaurant! And for those seeking the many advantages of business ownership, yet wanting a proven business concept, we encourage you to visit our franchise website. We also have a very special opportunity now available in Greenville, NC serving all the sports fans and seafood lovers in Pitt County - click here for details! Shuckin' Shack at Columbus Franchise Show This Weekend!